Can we talk about what the geniuses behind Santa Ana's Cauldron Ice Cream are up to? Just open since May, it wasn't enough to serve up the divinity that is nitrogen ice cream, so they went ahead and upped their game by gracing us with their take on the waffle cone-what they have dubbed the "puffle cone". 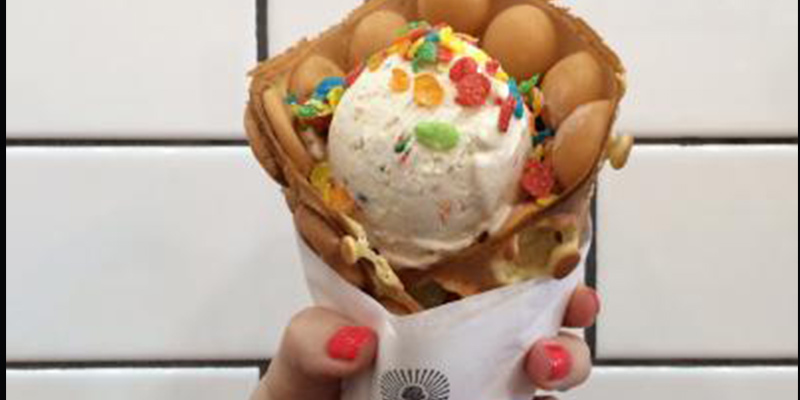 A puffle cone: a Hong Kong-style egg waffle that after being twisted into a cone is filled with nitrogen ice cream. The puffle cone can be eaten by breaking bubbles of the tender, pillow-like waffle off as you go, dipping them into the ice cream if you so choose. A helpful tip; watch the bottom of the cone, somebody (I am not naming names) may have totaled a favorite dress with chocolate drips yesterday. Flavors we tried: S'mores, Vietnamese Coffee, Rainbow Road, Mint Chocolate Chip, and H2O Rose. We passed on the Foie Gras, but power to the Cauldron for being bold enough to give it a go.